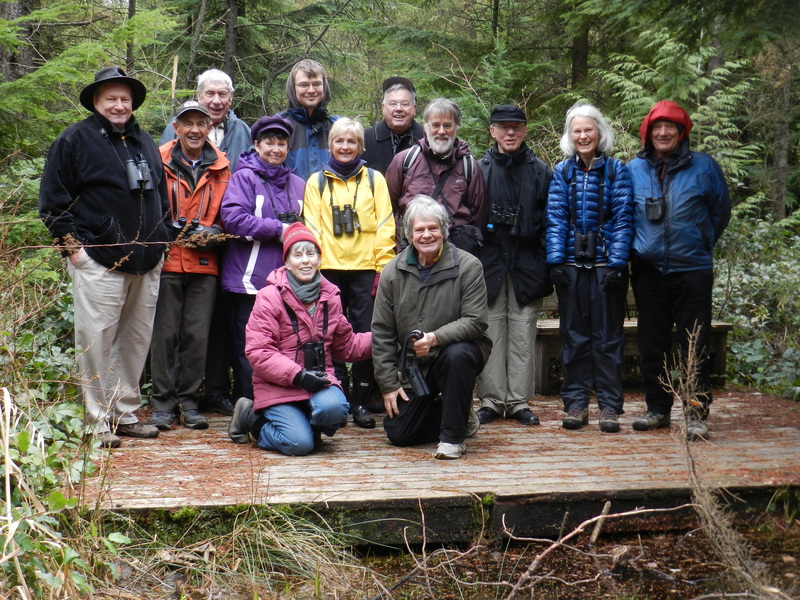 An “unlucky thirteen” birders (Anne M, Gerhard, Hans-Ulf, Bryan & Janet, Ken & Anne, White Rock Al, John McF, PB Lorna, Mike B, Burns Bog Jeremy and me) spent a very windy and chilly Monday morning of “almost Identification Birding” at the Delta Nature Reserve (DNR) in the Burns Bog. Hi-lites were Brown Creepers, a fallen tree on Ken’s car, and the Smoko at Tim Horton’s. Check out Ken’s and other’s photos on our DNCB Picasa site at http://picasaweb.google.com/dncbirding. At 8:30 a.m. we met Jeremy Nilson, Communications Coordinator with the Burns Bog Conservation Society (BBCS), in the Great Pacific Forum (GPF) parking lot near the entrance to the Burn Bog walkway. 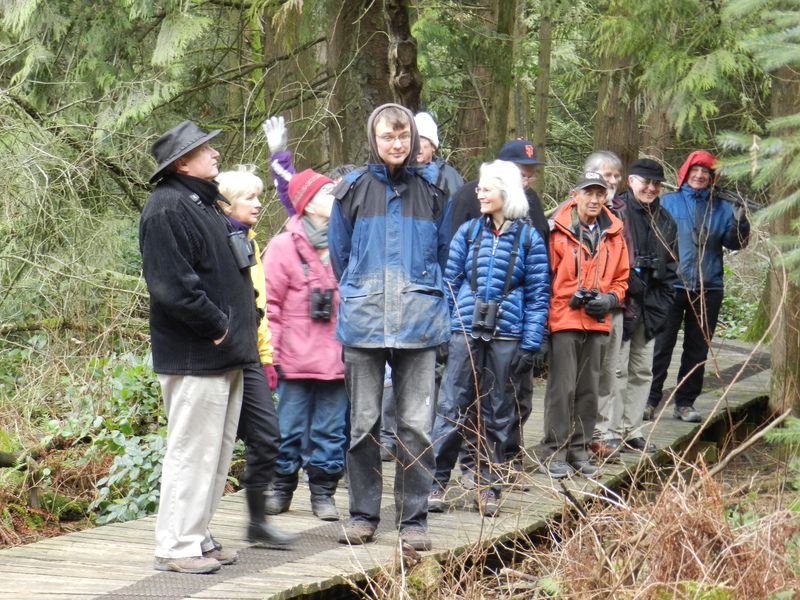 Jeremy had asked to join a Delta Nats outing at the DNR to help him Identify the Birds in Burns Bog. Following introductions, we started our walk along the path and boardwalk (maintained by the BBCS). Fallen branches were everywhere along our route, and with the howling wind and nearby highway traffic, hearing birds was impossible. We saw lots of woodpecker activity and a Bald Eagle kept circling over us, but other than that, the walk was very quiet. Anne pointed out a few neat plants (e.g. Labrador Tea, Sweet Gale in seed, Horse’s Hoof fungi aka “tinder conks”, and the “Shoe Tree”) which kept a few almost-interested participants awake. We stopped at the Sunken Tractor for our obligatory Group Photo, and Jeremy told the story of its never-found driver’s body possibly being near the tractor somewhere in the Bog beneath us. On leaving the boardwalk onto the main path, we got a brief flurry of bird activity. Among a group of Black-capped and Chestnut-backed Chickadees was at least one Golden-crowned Kinglet. A Hutton’s Vireo also flew past and then gave its distinctive call for quite some time. While watching a Downy Woodpecker, two Brown Creepers came close by and gave us good looks as they climbed up two neighbouring trunks. We saw a couple of Robins, House Finches and a flock of Starlings which may have put our day’s count into double figures. We returned to the Arena for a “Hans & ladies” break and watched the Over 65’s playing hockey; I thought about a career change from bird watching. The GPF restaurant was closed, so we headed back to the cars for a short trip to Tim Horton’s. 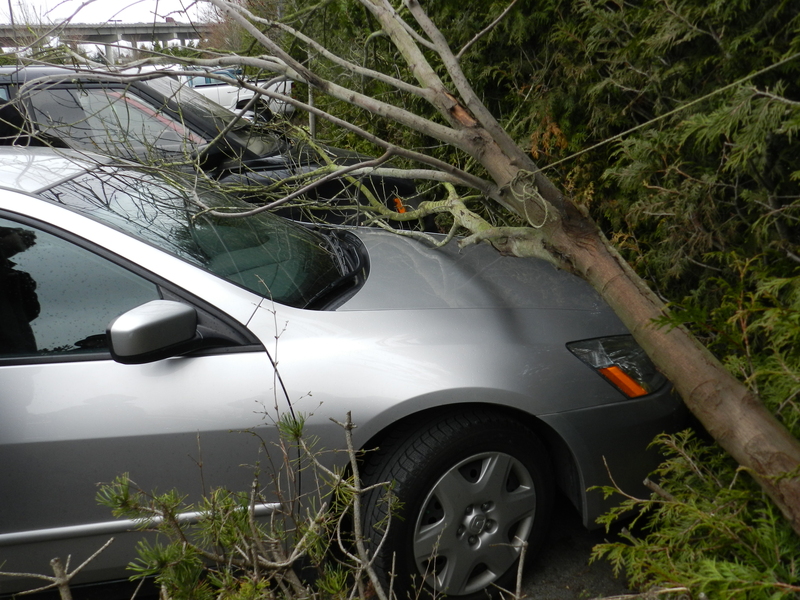 On arrival back at the vehicles, a huge branch was laying across Ken & Anne’s car. Fortunately, Strongman Jeremy was able to remove it without scratching the vehicle. Did I say it was a windy morning? So we went around the corner to Tim Horton’s, enjoyed tasty soup and sandwich, talked about the “interesting” morning and all the birds we didn’t see. This is how Delta Nats Casual Birders have fun. We had a super Delta Nats monthly meeting on Monday evening with Larry Cowan giving a beautiful and impressive presentation on his Birding Trip to Ecuador. Don’t forget our Birds on the Bay outing in BBRP tomorrow (Wednesday, March 14), meeting at Cammidge House at 9:00 a.m. This entry was posted in *DNCB, Burns Bog. Bookmark the permalink.